Chillers and cool stores can be damaged easily and replacement is costly, time-consuming and disruptive. We can repair, refurbish and maintain poly panel lined chillers, cool stores and food production areas with minimal disruption. All the chemicals we use are MPI approved and we supply MSDS for all chemicals that we bring to a site. We provide both steam and hot water cleans. Our full maintenance programs include the maintenance of all poly panel surfaces with regular inspections, cleaning, sanitising and repainting where necessary. To avoid the least disruption to staff and work schedules, our team is available 24/7 on planned shutdown work. Holes, gouges and perforations are cleaned, filled and faired with strong flexible compounds that are long-lasting. We try to match the panelling to the same colour as the existing when repainting areas. At Unique Services we use paints and coatings that adhere to international requirements for VOC (volatile organic compounds). Our range of products includes water-based epoxies. These paints are VOC-free and approved by the American Green Seal Organisation. 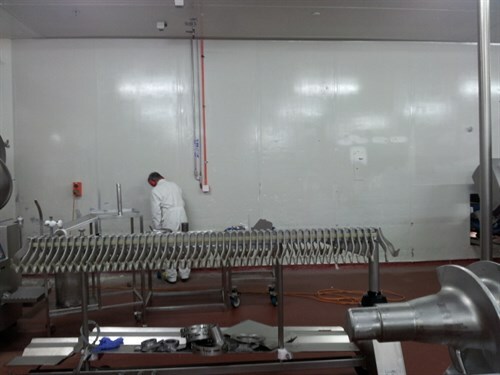 VOC free painting systems are used in food processing areas to avoid contamination of food products. We apply a range of anti-microbial finish coats that incorporate new technology which physically destroys pathogens rather than chemically poisoning them. 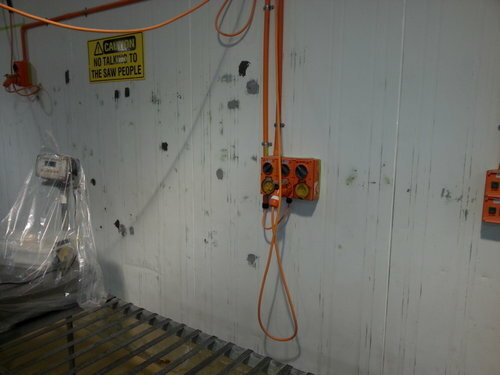 This system precludes leaching of toxic chemicals onto the surface of the dried coating. We work during shut-downs, nights and weekends to cause the least amount of disruption possible. We work around other trades on site to ensure work is completed on time and within budget.